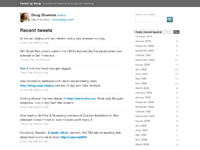 Last month, I posted a short little write-up about how I created my own tweet archive. It was a quick hack, pulled together one Saturday afternoon, and fairly incomplete, at best. But the archive serves its simple purpose every now and then. I intended to update the archive, add some features, and modify the theme files to better prep them for distribution. But I’m realizing I probably won’t get around to that any time soon. I’m seeing lots of other folks building out their own archive. And lots of them are using the WordPress solution I wrote about. So in the interest of providing a rough starting point, I’m making the WP theme files for my tweet archive available here (under a CC license) for anyone who wants them as a base. Download tweets.zip (39 KB). One followup note… Andy Graulund (@graulund) is building a similar tweet archive that is much more robust and more awesome than my original. His is a PHP-based solution (no WordPress required) with embedded media, permalinks back to Twitter, graphs showing tweet activity, and more. I believe he’s planning on releasing his source soon. Keep an eye out for that. 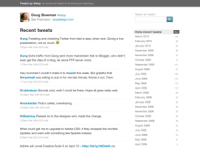 WordPress-based browsable, searchable archive of tweets by Douglas Bowman is licensed under a Creative Commons Attribution 3.0 Unported License. In the past, I’ve wanted to browse or search through my own tweets. Viewing my Twitter profile is one way to do that. But if I want to browse back through history, it’s a chore to go back very far. And forget about searching through my own tweets on Twitter since Twitter Search currently only goes back about a seven days.